The German Bundesliga is most popular for their fast, dynamic games which are therefore entertaining to watch. Especially for their defensive organisation and aggressive pressing German teams are known all over in Europe. There are some reasons why Guardiola, for example, called the Bundesliga a pressing and counter competition. 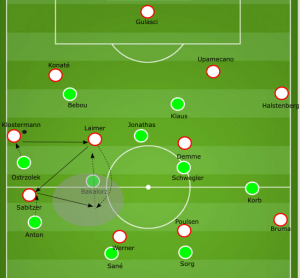 In this piece, I want to take a quick look at the pressing mechanisms of Hannover who faced RB Leipzig. Leipzig vs Hannover was quite an interesting game. Hannover which got promoted this season and started the season really well challenged Leipzig, the second placed team from last year. Especially Leipzig is known for their special philosophy which is implemented in all of their teams, including their youth teams as well as the other Red Bull clubs for example Salzburg. In this game, Hannover´s approach to press Leipzig was really interesting because it showed some strategical advantages but also disadvantages which Leipzig could use especially in the second half. The game between those two teams was a real pressing fight, especially in the first twenty minutes. Hannover surprisingly pushed high and wanted to disrupt Leipzig’s build-up out of the back. Therefore, Hannover used a 5-2-3 formation with clear man orientations on the pitch. The front three of Hannover had different tasks to disrupt Leipzig’s build-up. Both wingers, Klaus and Bebou had to press Leipzig’s centre backs when they received the ball. Compared to other pressing ways Hannover’s wingers didn’t use curved runs to isolate one of Leipzig’s players or push them to one side. Instead, both moved diagonally out of the position. By pressing in that way, they made sure to cut diagonal passing lines to Demme and Laimer, Leipzig’s central midfielders. That’s why Hannovers defensive shape stayed balanced while they could pressure Leipzig’s centre backs. Due to the movement of Bebou and Klaus Leipzig got forced to one side without access to the middle of the pitch. When Konaté or Upamecano played the ball to the fullbacks, Hannover could quickly shift to that side and apply pressure by cutting passing lines and making the available space as small as possible. Important was the pushing out of position by both fullbacks of Hannover. When Leipzig got pushed to one side, they moved higher to pressure Klostermann and Halstenberg immediately. At the beginning, Leipzig´s centre backs had to play many long balls or risky passes to avoid turnovers in their own half. Because I wanted to understand the movements and actions during Hannover’s pressing I took a closer look at some actions and mechanisms in the pressing of Breitenreiters team. Which caught my eye was the movements of the wingers when Leipzig tried to switch the play by using a short-pass between the centre backs. Bebou and Klaus anticipate those passes very good and moved out of position with precise timing. The objective was to press Upamecano and Konaté in a way that they couldn’t turn and shift the play to the other side. Because of the pressing of the wingers the centre backs of Leipzig had to take the first touch towards the centre and got pressured immediately. Hannover forced them into the centre were Jonathas covered the space. So, the centre backs had to take risks to solve those problems with forwarding passes or dribbles. Jonathas, who normally covered the space around Demme and Laimer and sometimes followed them man-oriented, could press the centre back who advanced into the middle because Hannover’s central midfielders pushed higher to press Demme and Laimer. In the same scene, Hannovers problems got obvious. Problems which are common in German football philosophy in which man orientations are used frequently. Leipzig used those disadvantages against Hannover. For example, in the described scene above, Upamecano dribbles with the ball into the six- space. Jonathas who should pressure Upamecano moved out of his space because of the side warts movement of Demme. Also, Hannover’s central midfielders only concentrated on Demme and Laimer, their natural opponents, however, Sabitzer positioned himself in the half-space and got free when he moved into the middle. In the end, Upamecano could play a through ball between the lines to Sabitzer and Leipzig started a dangerous attack with a 4 against 5 situation. From a situation in which Hannover was compact and forced Leipzig in the middle, Leipzig could play out of the pressure and created a dangerous attacking situation because Hannover’s players got forced out of position due to their orientation towards the opponent. Despite the man orientations, Hannover’s defensive shape had another weakness. They defended with only three lines. Fewer lines mean you have a good horizontal compactness however the spaces between the lines can get bigger and is harder to defend due to a step-up out of position. Especially in the last line, Hannover had to risk a lot when the center backs pushed higher to press. The few times Leipzig was able to use the space the defenders left by using the play over the third man in midfield, Leipzig got dangerous because of their advantages of speed and technique in high tempo situations. But it is important to mention that those man orientations were not always a weakness for Hannover. Because of the clear allocation of opponents, Hannover prevented switching situations and also could provide pressure all the time. Particularly on the wing, so Hannover was able to defend quite compact and aggressively. In the case of Hannover, those spaces between the lines were not such a big problem all the time. On the one hand, Leipzig rarely could use those spaces out of their 4-2-2-2 formation in build-up because they sometimes lack calmness and the right positioning and decision making to really use those open spaces. On the other hand, Hannover denied Leipzig the time to turn when they receive the ball and make decisions. Similar to Klaus movement which I described the rest of the team also pressured Leipzig. Hannover anticipated certain passes early and well, therefore, they quickly pushed out of position to reduce the space around Leipzig’s players and give them no time. Due to their man orientations, they had no problems of communicating who attacks who. The wingers of Hannover pressured Klostermann and Halstenberg immediately when they receive the ball. Klaus and Bebou closed down the centre backs while the ball near central midfielder either Schwegler or Bakalorz, pushed higher to pressure Laimer or Demme who supported the fullbacks. Here is a good example how Hannover started pressing Leipzig. After Upamecano passed the ball out to Halstenberg Hannover quickly shifted on that side narrowed the available space for the left-back. Important to mention is the timing when Korb and Schwegler started to sprint out of their position. They started immediately when Upamecano released the ball, hence Halstenberg got pressured right away. As I mentioned above the aggressive push out of position as well as the man-orientations can have a lot of advantages due to easier processes in defending. Though when the timing is not perfect the advantages quickly convert into disadvantages because the opponent can use your dynamic to destabilise you and use the space you left. In this example the problems of aggressively pushing out of position if the timing is wrong got obvious. After a long ball from Upamecano to Klostermann Hannover quickly pushed on that side, though Jonathas shifted to the right side before he now is not able to press Laimer from behind, so Bakalorz has to push out of position to prevent Laimer from turning with the ball. The timing of that run was too late. When Laimer received the ball the distance between Bakalorz and him was too big. Laimer played the ball to Sabitzer and used his advantage to get into the space Bakalorz left, Hannover´s central midfielder has to change direction so he couldn´t get back in position quickly enough. If Anton wouldn´t intercept the pass Leipzig could create a dangerous situation, when Sabitzer played the ball back to Laimer, because Laimer could dribble with time and space in Hannover´s half. If you follow German football regularly you can observe the lack of quality teams have in possession. Due to the influence of Guardiola and other coaches the level of ability in possession raised over the last few years. Especially Julian Nagelsmann had great success because his Hoffenheim team could be effective on the counter as well as with longer phases of possession. Also, other coaches start to focus more on the game with the ball. However, many teams are not able to outplay a pressing consistently and effectively. Leipzig also struggled to use Hannovers gaps in their defensive shape. You have to add that there were not so many gaps. But as I showed above, if Leipzig would have played calmer and had a better structure they could provoke Hannover to certain actions and use the resulting space. In the end, Leipzig won the game because after Hasenhüttl changed the tasks and movements in midfield, Leipzig was able to use the space which Hannover provides. However, Hannover’s pressing worked very well in the first half. And generated some very important interceptions which created dangerous chances for Hannover. The pressing was organised well but provided some issues. Especially the many strict man-orientations can give you advantages in pressuring quickly but also opens space for your opponent. In the end, it was too much space for Leipzig and that’s why they deserved the win.